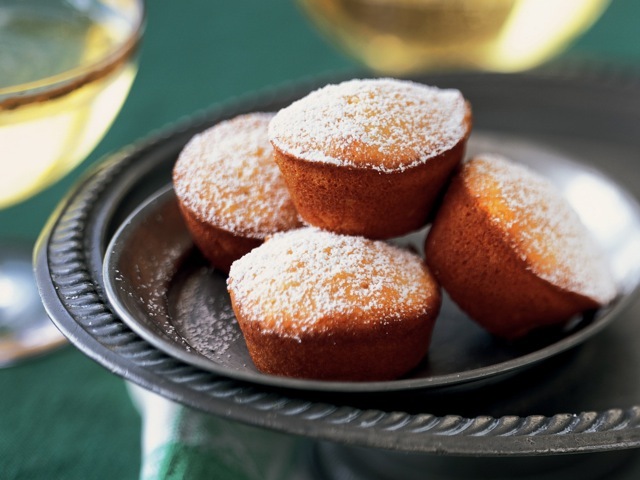 These golden sweets look like a cookie, but are tender like a cake, delicately reminiscent of another French teatime treat, the madeleine cookie. A Gunpowder green tea would be an ideal accompaniment. Look for almond meal at specialty food markets. Whisk together the almond meal and flour until blended. In a stand mixer on medium speed, whisk the egg whites. When the whites change from loose to slightly loose foam, add the sugar in a steady sprinkle, over 4 to 6 minutes. The whites will be glossy and moist. Sift the flour mixture over the egg whites in 3 or 4 portions. Gently fold each addition before adding the next. Fold in the honey, followed by the butter. The batter should be glossy, light, and smooth. Cover with plastic wrap; let rest at room temperature for 30 minutes. Preheat the oven to 425 degrees. Brush the cups of a mini-cupcake tin with additional melted butter. Sift all-purpose flour over the molds to coat them, invert, and tap several times to shake out excess. Spoon the batter into the molds, filling them three-quarters full. Bake until golden-brown, 8 to 10 minutes. Cool on a wire rack for 5 minutes before unmolding. The cakes are best enjoyed the day they are baked.